What's New for the 2018 Lincoln MKC? For 2018, the Lincoln MKC is surging forward in the luxury crossover world. Boasting new features such as active noise control, approach detection, and active park assist, the MKC is a massive competitor in today's market. Find out about these features and more below. 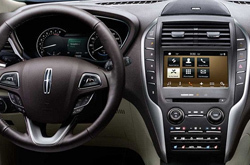 Lincoln's new MKC is packed full of luxurious options and features. 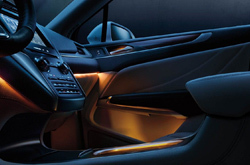 Ambient lighting allows you to match your mood to one of seven hue color choices. The light emits from various locations including the front and rear footwells, cupholders, and the door handles. The side mirrors are auto-folding power mirrors that automatically fold in after you park and lock your doors. Additionally, the mirrors can adjust to help you avoid hitting objects while parking. The MKC also promotes approach detection. As you approach your car with the key fob on you, the exterior lighting brightens and glows softly. A Lincoln welcome mat is projected on the ground by both the driver side and passenger side doors showcasing the company logo, and once you are in the car, the ambient lighting brings back the sense of warmth and comfort. The steering wheel is wrapped in hand-stitched Wollsdorf leather and perfectly compliments the leather-trimmed seats made specifically for Lincoln. 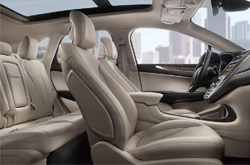 The culmination of the craftsmanship and comfort come together to form a peaceful space that is enhanced even more by the climate control and the heated/cooled front seats. A panoramic vista roof enhances the feel and openness of the MKC even more. It provides both the front and rear passengers with a sweeping view of the outside. It also comes with a power shade to block out the sun and keep the interior at a comfortable temperature. The MKC comes with the choice of two engines. A twin-scrolled turbocharged 2.3L engine and turbocharged 1-4 2L engine. The 2.3L engine has respectable 285 horsepower and 305 ft-lb of torque. With a combination of turbocharging, direct injection, and twin independent variable camshaft timing, the 2.3L engine can tow up to 3,000 lbs. The 2L engine, which is the base engine, delivers 245 horsepower and utilizes the same 3 technologies allowing it to also tow up to 3,000 lbs. The base engine (2L) has a better fuel economy with an EPA-estimated 21 mpg city and 28 mpg highway. The more powerful 2.3L engine can get 18 mpg and 25 mpg respectively. 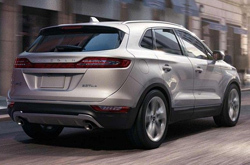 The National Highway Traffic Safety Administration awarded the MKC with a 4 star safety rating. 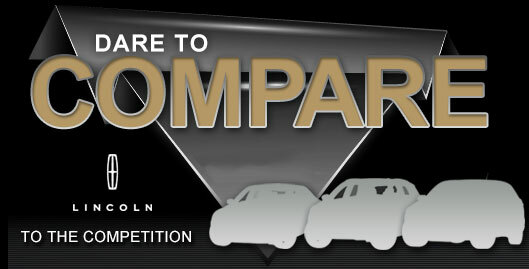 It was rated 5 stars in nearly every test including side barrier, side crash, and combined side barrier & pole ratings. With a risk of rollover at only 16.4%, the MKC definitely deserves its rating. The frontal crash test, which was 4 star, is a minor setback to the overall safety. There are airbags on all sides and even around the knees. In addition, the seatbelts feature pretensioners that automatically tighten to ensure that the occupant is in the optimal position to prevent injury during a collision. The MKC also includes active park assist and lane keeping technology that use ultrasonic sensors to take the guesswork out of parking and warns you when you are drifting out of your lane. If you are at all interested, Grapevine Ford welcomes you to take the 2018 Lincoln MKC for a test drive!